Autumn is harvest season, which brings a plethora of fabulous fresh produce for us to enjoy! During this time, we have our peak season for crisp apples and pears. 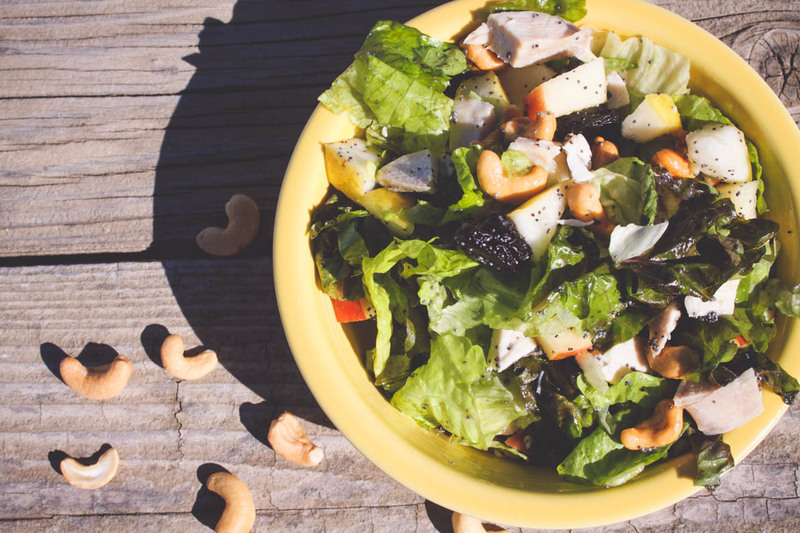 This salad combines the tartness of these beloved fall fruits with the crunchiness of cashews. When you top it off with the homemade Poppyseed Dressing, it is sure to be a hit for all of you salad lovers out there, like myself! Often, I am asked to bring this recipe as a side dish for Autumn parties and Thanksgiving, which is fabulous because it is so simple. As a side note, I omit the chicken if serving it as a side dish! Chop lettuce, green onion, pear, apple, and cooked chicken, place into a large serving salad bowl. Add cashews and dried cranberries. In a small side bowl, mix all other ingredients and whisk throughly until blended. Drizzle over the salad. Combine and toss salad until mixed. Chicken can be omitted if you prefer to use this as a side dish.